The results of the 2019 Brokers on Banks survey indicate the continuation of a development noted last year – namely, that banks are falling in the estimation of brokers surveyed by MPA. Nothing has changed in the way brokers are assessing banks – the four criteria ranked as most important were the same as in 2018: turnaround times, BDM support, credit policy and interest rates. In 2017, the overall winner (Westpac) had a fi nal score of 3.72. Last year, the winner (ANZ) had a much lower final score of 2.76. The drop-off continued this year with the winning bank achieving a score of 2.54. This score would have placed them third in last year’s rankings. There were a few dramatic developments as one of the majors (and a previous overall winner) dropped from second place last year to fifth this year. On the other hand, a non-major leapfrogged its opponents from a finish of sixth in 2018 to an impressive second place in 2019. As many of the responses to our survey indicate, the banks that were most preferred usually excelled in the category of turnaround times, or had made significant improvements to facilities that eased interactions between broker and lender. The Royal Commission into Misconduct in the Banking, Superannuation and Financial Services Industry brought to the fore a lot of friction between brokers and banks. On top of the recent ASIC and Productivity Commission reports, this is likely what accounts for brokers’ lower estimation of banks in general. Notably, the top two finishers this year achieved a top three ranking in every one of the nine criteria by which they were assessed. Their consistency was reflected in their triumph. Although relations between bankers and brokers may seem sour at the moment, brokers’ responses consistently emphasised the paramount importance of turnaround times, BDM support, and measures taken by banks to foster good relationships. If banks can go some way to alleviating the legitimate grievances brokers have developed over the past year, we may in future see a return to higher final ratings for the banks. At the start of this year, APRA’s benchmark for interest-only loans was lifted after the regulator said it was satisfied that lenders had improved their lending standards and taken measures to reduce higher-risk lending. The benchmark, which was introduced in March 2017, restricted banks’ new interest only loans to 30% of new residential mortgage lending. However, in December the national cash rate at the same level (1.50%) since August 2016. Brokers have not welcomed such bank-initiated rate hikes. The effect of relaxing these regulations – along with the RBA’s February announcement that the cash rate would hold steady at 1.50% and not rise, as some had feared – doesn’t appear to have quelled many banks’ appetites for still higher rates. In the first two months of 2019, 14 lenders increased their variable home loan rates. On the other hand, during the same period eight lenders made cuts. Brokers took to the survey to comment on interest-only loans, with many saying the di­fferences in interest rates between IO and principal and interest loans were just too high. “Most of my clients are on P&I. I will only go IO for investment clients if it is in their best interest,” said one broker from Casuarina. A lot of brokers also said there was no single bank with the best IO rates because of the constantly changing policies and rates. “[It] varies week to week depending on whether they want to grow or slow the IO caps,” said a broker from Seville Grove. While the overall balance appears to be tilting towards continuing rate hikes by the banks across products, one conspicuous exception to the trend is Bankwest, which announced in January that it would cut interest rates for borrowers with higher deposits. This may come as little surprise to those brokers we surveyed for this report, whose votes took Bankwest to the top of the pile – it came in first in the category of interest rates. This marks a return to the podium for Bankwest in this category, as the lender placed outside the top three last year after being ranked third in MPA’s 2017 survey. One broker from Freshwater said, “Bankwest have obviously invested a lot of money into the end-to-end application process right through to settlement and beyond. Seamless process.” ANZ held steady on interest rate measures, ranking third for the second year in a row. ING recovered in this category, placing second this year after slipping from a first place finish in 2017 down to eighth in 2018. Last year’s top ranker, Westpac, slipped down to equal fifth this year, while 2018 interest rate runner-up St. George fell to seventh place. These rankings come, however, against a backdrop of marked dissatisfaction among brokers with the prices and range of products o­ffered by the banks: 53% of brokers said they believed both had worsened over the previous year, as against 47% who thought they’d improved. This is a dramatic change from last year, when 68% of brokers registered an improvement, versus only 32% claiming deterioration. Furthermore, the previous three annual surveys registered a majority thinking on balance that the situation had improved. 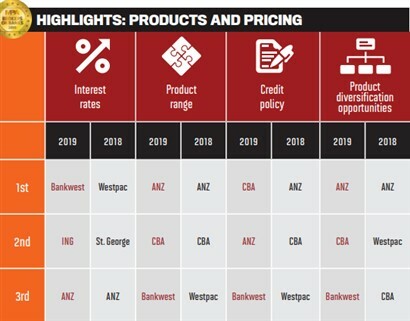 While ANZ and CBA largely maintained their strong showings from last year in products and pricing, the striking development was that Westpac and Bankwest traded places this year. 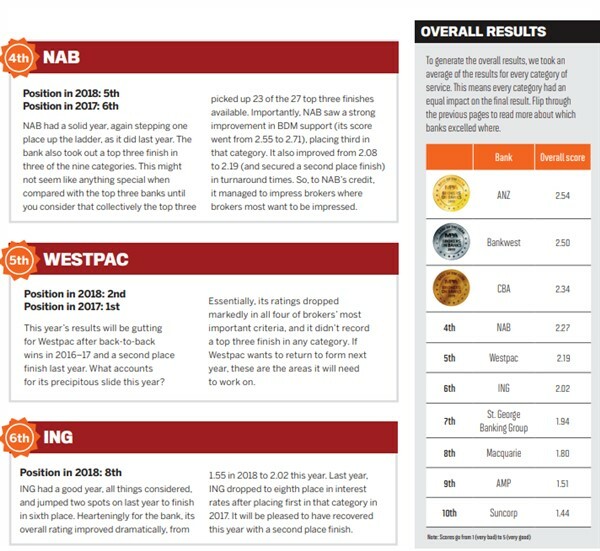 Having made top three in all four criteria in 2018, Westpac failed to make a top three spot in any of the four criteria this year. After no top three finishes last year, in 2019 Bankwest is a podium finisher in all four criteria. With ASIC, the Productivity Commission and the royal commission all directing their scrutiny at remuneration structures over the last year, it’s clear that many brokers resent what is perceived to be unfair treatment. In late 2017, the Combined Industry Forum proposed what it saw as positive changes to the remuneration structure for mortgage brokers – with the stated intention of reducing conflicts of interest and bettering customer outcomes. The CIF model proposed that remuneration be based on funds drawn down and utilised by the borrower, such that upfront commissions would be paid dependent on the facility limit drawn down, and the amount drawn down net of offset account balances (if applicable). The intention was to reduce incentives for brokers to have clients take out larger loans than they could afford because they could park a substantial amount in an offset account. Bankwest was the first to adopt such a commission structure in mid-2018, but since then the four majors have followed suit. 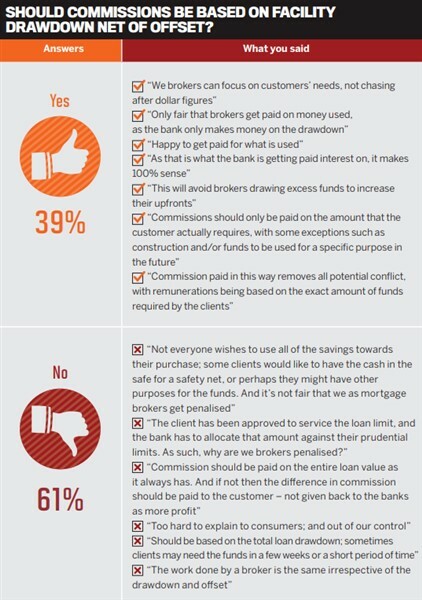 Brokers responded to the survey with mixed views of the CIF’s recommendations, although it would be fair to say that it is a preferred model over the one the industry is facing now. “This is going to be impossible for us to monitor, and we cannot trust the banks to pay us when funds are eventually drawn. This is the worst decision in my 14 years as a broker that the banks have implemented,” said one broker from Beaumaris. 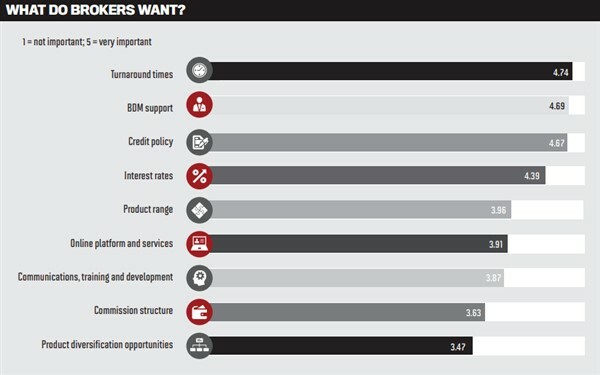 Despite the passionate comments, out of the nine criteria on which brokers were asked to rate the banks, commission structure was seen as second-least important to respondents. This may reflect an impression in the broker community that there is increasingly little to distinguish between the banks when it comes to commission structures. Looking ahead this year, the major story continues to be the fallout from the royal commission’s recommendation that the current remuneration structure should be completely abolished. Commissioner Hayne expressed the view that a flat fee paid to the broker by the borrower should replace the current system of commissions paid by the banks. The final report outlined the transition it proposed: “The borrower, not the lender, should pay the mortgage broker a fee for acting in connection with home lending. The broker community has expressed outrage over the proposals, indicating that such changes would cripple their businesses, empower the big banks and rob borrowers of their best chance of securing a competitively priced loan. Particular ire was reserved for CBA and its CEO Matt Comyn, who in the final round of the commission’s public hearings endorsed the switch to a flat fee for service. Compounding broker frustration was Comyn’s additional assertion to the commission that brokers provided almost no additional services to clients after initial completion of the loan, and that this justified the abolition of trailing commissions paid to brokers. This could be why CBA was pushed out of its 2018 position of third place for commission structure. Research conducted by HashChing found that 57% of brokers would refuse to use CBA in future if the fee-for-service model came into effect. It’s no surprise that turnaround times once again topped the list as the most important criterion in respondents’ evaluation of the banks. The intense public scrutiny of banks over the last year – not least the royal commission’s criticism of lax lending practices – has undoubtedly had a major impact on turnaround times. Consequently, turnaround times have blown out as brokers and banks conduct more checks. A frequent complaint from brokers is that their workloads have doubled with all the extra reviews and paperwork they have to undertake, while simultaneously their applications have become more likely to be declined. 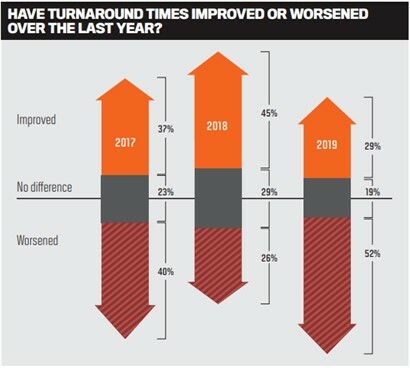 In this year’s survey, 52% of brokers said turnaround times had either worsened or worsened considerably. With 19% claiming no di­fference from last year, that left a paltry 29% on the ‘improved’ side of the ledger. This is a dramatic drop from last year, when our survey showed that 45% saw an improvement, and only 26% saw a deterioration. Not only that but the percentage of those citing an improvement was substantially lower than it was in the previous three years’ surveys. 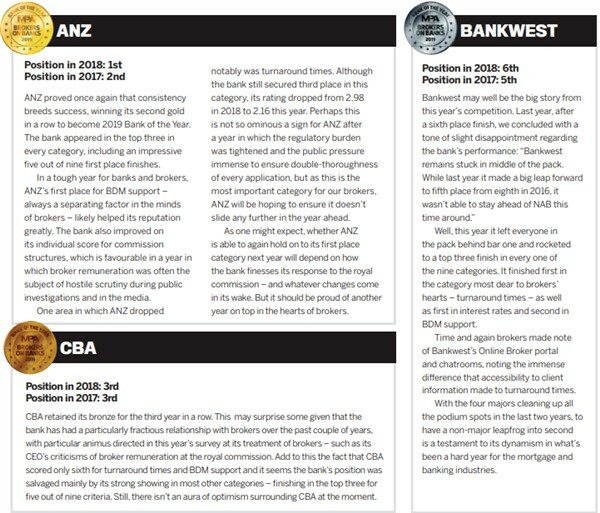 Brokers this year awarded Bankwest the highest ranking for turnaround times, followed by NAB and ANZ. 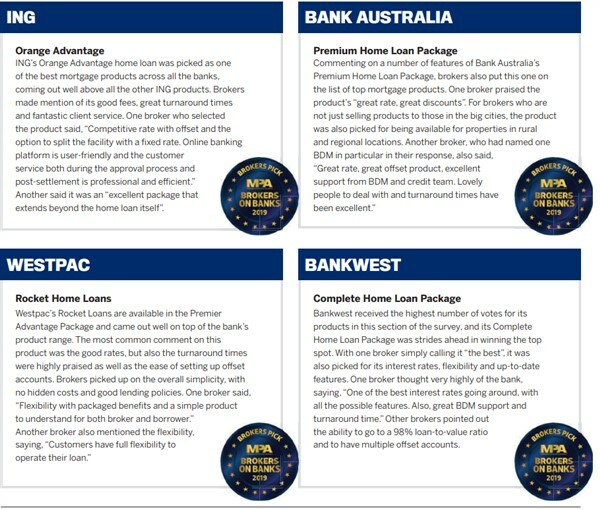 The preference among brokers for these three banks was also reflected in their ratings for BDM support – in which ANZ came first, with Bankwest and NAB following behind. The similarity of results in these two categories reflects the reality that e­ffective BDM support is a major contributor to quicker turnaround times. Recognising this, brokers rated BDM support as the second most important of the nine criteria when evaluating banks. Our survey asked whether any particular technological innovations by banks had helped to improve turnaround times. 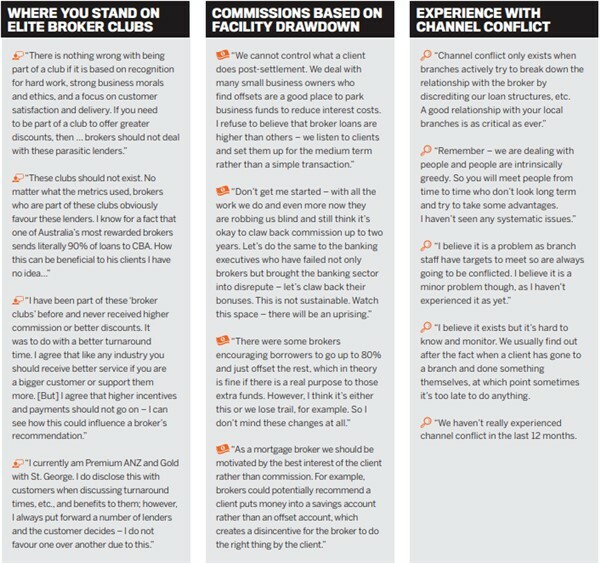 Many brokers commented enthusiastically on Bankwest Broker’s online portal and chat facilities. Brokers’ comments indicated that the quick and easy access to important client records facilitated more efficient communication between brokers and Bankwest, cutting down on turnaround times. A number of brokers also made mention of the fact that they had shifted more business toward Bankwest, ANZ and NAB in the past 12 months on account of the superior BDM support and turnaround times offered by these banks. Mortgage Brokers have been getting a lot of fi re over the past year. Since late 2017, ASIC, the Productivity Commission and the royal commission have all released reports questioning the value brokers add to consumers seeking a loan. The Productivity Commission and the royal commission both advocated the abolition of trailing commissions, with Commissioner Hayne claiming brokers were getting “money for nothing”. While our survey was conducted before the release of the commission’s final report and so doesn’t address the now-immediate concern of the wholesale remuneration structure, our respondents did provide us with useful insights into their role in facilitating consumer choice and getting better deals for their clients. That said, brokers’ responses to the proposed changes to remuneration were sharply critical. The royal commission has also sparked further emotion in regard to channel conflict. The number of brokers who believe it is a major problem has grown over the last few surveys. This year’s increase could be down to the heads of the big banks who spoke at the royal commission hearings sometimes playing down the role of the broker. Respondents who believe there is channel conflict were very vocal about the exact banks they were thinking of, and mostly referred to the big four, their reasons being issues over turnaround times and ease of accessing finance. Many said they had stopped using banks due to poor broker support, slow approval processes, their appearances during the royal commission, and reduced BDM support. This year there is an almost even split between brokers who do and don’t want to be part of an elite club. Last year the results were further apart, with 61% saying yes and 39% no. We have highlighted five responses to our Prize Question here. All five brokers will be sent a Home Mini for their answers. It’s been a difficult year for banks and other lenders. Why did brokers pick ANZ as their favourite bank for the second year in a row? It’s a privilege to win this award, and it’s a great acknowledgement of the great work our extended broker teams do on a daily basis. We are aware there are areas where we need to improve, including finding ways to be simpler and faster, which are especially critical across the entire home loan process. Rest assured we are listening and taking appropriate actions behind the scenes. While we acknowledge there is work to do, overall we are incredibly proud of our people and our culture. We are regularly told our BDMs are the most informed, responsive and accountable in market. We have a strong speak-up culture and prioritise continuous learning and development, which helps us to attract and retain the best and brightest talent. Our BDMs make this business what it is across the country, and everyone’s resilience and professionalism are essential ingredients to the success of this business. ANZ has played, and will continue to play, a very active role in the Combined Industry Forum because we recognise that coming together as an industry has never been more important. We have already implemented a number of CIF recommendations and are very proud of the leadership role our extended team has played across the industry in the past year. We aim to continue to earn the market’s trust by engaging thoughtfully when we introduce changes. We need to make sure we think carefully about the impact and consider the potential internal and external unintended consequences. ANZ’s highest score overall was for its BDM support. What are your BDMs doing to continue the bank’s support of the broker channel, and why is that important to the ANZ? Our entire BDM team continue to stand out from the crowd for the right reasons. We often hear that our BDMs are known for their specialist knowledge, but above all their responsiveness, ownership of customer deals and, more specifically, how they collaborate across the bank to deliver the right customer outcomes. If I look across all the categories that we’ve been successful in, for the most part our success can be attributed to our extended BDM team. For example, our BDMs not only interact with brokers but also play a role in creating educational content and leading our training program. We invest time and resources to ensure that our people are supported, particularly in a period of intense change, so they are able to communicate with brokers clearly and consistently. ANZ also came top for its product range. Why is it important that brokers are recognising the options the bank offers their customers? For ANZ, and in particular when thinking about the overall broker experience, this points to the strength of our broader business, including our internal collaboration across residential and commercial. Our residential and commercial teams sit side by side across the country, which ensures each individual broker relationship is being managed as one, irrespective of product and customer need. Our home loan options have remained quite consistent over the years. With nearly 30-plus lenders on our brokers’ panel, this type of simplicity adds to the overall broker experience. That said, we always have room to improve, and we’re working hard on improving our customer focus across our products and packages. The bank came in at first place for its communications, training and development for its second year. What have you done to continue your success in this area, and why was it important? One of our goals has been to lead the market with data and insights and to drive positive change through education and training. Over the past 12 months we have partnered with aggregators to understand in greater detail our strengths and opportunities. We want to be transparent about our mutual data insights so we can ask ourselves: how can we drive better outcomes for our customers? In 2018, alongside our traditional webinar program, we trialled partnered podcasts with aggregators and, not surprisingly, found that we got the best response from broker-led content. We also understand the need for further in-depth training for brokers at different stages of their careers, which is why our face-to-face program offers training from New Entrant to Complex Loan Scenarios. For us, education is not just about our aggregators and brokers but also our own ANZ teams. We’ve been focused on building a balanced culture that considers the customer’s needs first and foremost.